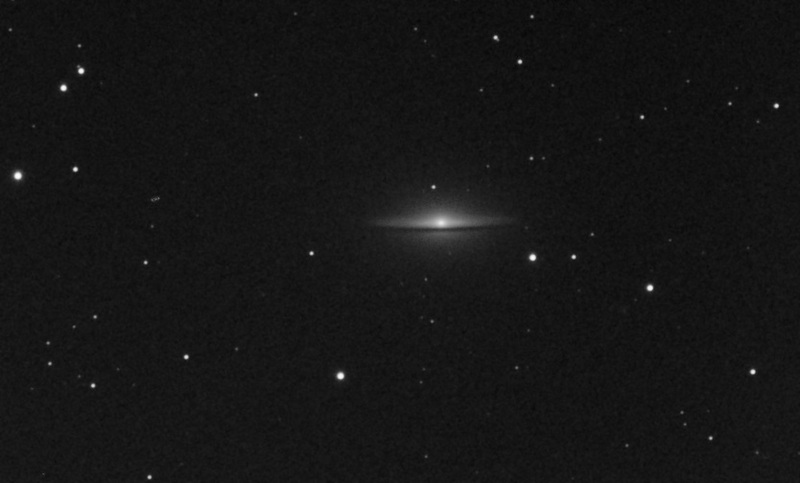 Adrian Brown took the following image of the Sombrero Galaxy (M104) in April 2007. He used a clear infra-red blocking filter and a light pollution filter with an ATIK ATK16HR camera through a Skywatcher 80ED Pro refractor at f7.5. This was guided using an ATIK ATK-2HS camera through a Skywatcher 80T refractor. The set up was mounted on a Celestron CGE mount. The image is comprised of six 5 minute exposures. Whilst Adrian was combining the raw exposures for M104 above, he noticed a 'star' which was moving relative to the others in the field. He checked the image coordinates against the Minor Planet Checker at the IAU and found that asteroid 1274 Delportia was the brightest candidate at the time he was taking the images. An animated GIF of the asteroid moving across the same field as M104 is shown below. It has been heavily processed to reduce the file size. Delportia can be seen moving from top to bottom over a small area of the upper section of the image.